Jesus built the church that He bought with His blood (Matt 16:18; Acts 20:28). Where can someone find the church that Jesus built? With great concern and compassion for those looking for the church that Christ built, the following consists of Scriptures and its truth about the church of Christ. How can anyone identify that body of people? What are the characteristics of the church of Christ? The church is God’s people (1 Pet 2:9). Christians are the house of God if they hold fast the hope unto the end. Jesus is over God’s house. Jesus built the Church, and Jesus’s apostles describe the church as a house, God’s house — the Temple. Students of the Scriptures can see Christ’s design for His temple in His words. 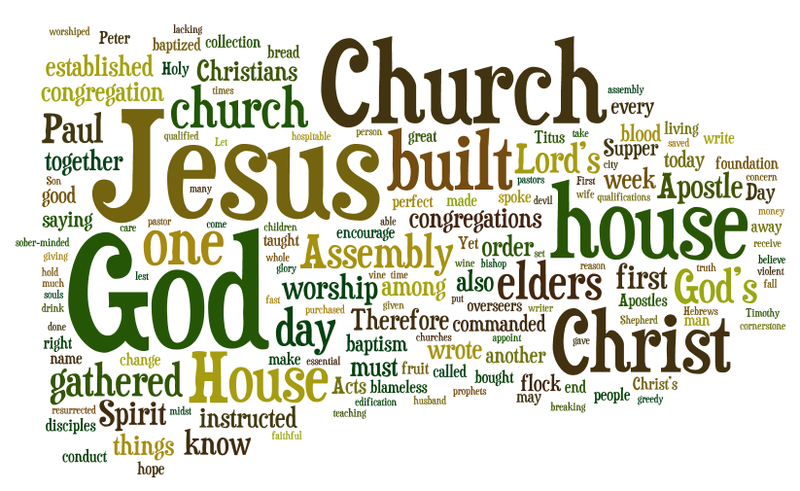 The apostles describe that church as a house put together perfectly by Jesus Christ. Christ’s Spirit spoke through the apostle Paul to Timothy declaring, “These things I write to you, though I hope to come to you shortly; but if I am delayed, I write so that you may know how you ought to conduct yourself in the house of God, which is the church of the living God, the pillar and ground of the truth” (1 Tim 3:15). God has a house, which is support of the truth, the Word of God (John 17:17). People often neglect God’s house without comparing Jesus’s church in the Scriptures to the many diverse churches in the world today. The writer of Hebrews expressed, “For this One has been counted worthy of more glory than Moses, inasmuch as He who built the house has more honor than the house […] but Christ as a Son over His own house, whose house we are if we hold fast the confidence and the rejoicing of the hope firm to the end” (Heb 3:3, 6). Christ revealed that He would build His Church as He called it “My church” (Matt 16:18). Therefore, the true church is the church of Christ, which He bought with His own blood (Acts 20:28). Christ established the most expensive and greatest institution ever, which is His church. Jesus purchased the house of God. He built the church with Himself as the cornerstone and His apostles and prophets as the foundation. By Christ’s Spirit, the apostle Paul depicted that Christ “having been built on the foundation of the apostles and prophets, Jesus Christ Himself being the chief cornerstone” (Eph 2:20). Upon this foundation, Christ spoke through the apostle Peter that each Christian is a stone built into the house of God (1 Pet 2:5). Christ is over the house of God for He has bought the church with His blood. Therefore, Jesus proclaimed that He has all authority (Matt 28:18–20). Jesus designed and built His house completely being divinely perfect. Therefore, no one has the right to modify God’s House, the church, because Jesus built it. Jesus gave His words to His apostles, so that Christ’s followers know how to conduct themselves in the house of God (John 15:20; 17:8). Therefore, Christians possess the ability to maintain the church that Jesus built today (1 Tim 3:15). Churches consist of imperfect people, and imperfect churches are everywhere. However, Jesus maintains a congregation as without spot and blemish “if indeed you continue in the faith, stable and steadfast, not shifting from the hope of the gospel that you heard” (Col 1:21–23). In 1 Timothy 3:15, Paul expressed how Christ organized the church by organizing each congregations that qualified elders govern and deacons serve under them (1 Tim 3). Jesus established that elders pastor and oversee a congregation (Acts 20:28–30; 1 Pet 5:1–3). The apostle Paul and his associate Barnabas “appointed elders in every church” (Acts 14:23), and Paul instructed Titus to “set in order the things that are lacking, and appoint elders in every city as I commanded you” (Titus 1:5). Paul instructed the elders at Ephesus, “Therefore take heed to yourselves and to all the flock, among which the Holy Spirit has made you overseers, to pastor the church of God which He purchased with His own blood” (Acts 20:28). The New Testament writers only mention elders as church pastors. However, many churches today have changed their preachers and ministers into pastors without them meeting the biblical qualification for an elder. Furthermore, Christ gave these pasturing elder a great responsibility to oversee the church. The apostle Peter wrote to church elders instructing them, “Shepherd [pastor] the flock of God which is among you, serving as overseers, not by compulsion but willingly, not for dishonest gain but eagerly; nor as being lords over those entrusted to you, but being examples to the flock; and when the Chief Shepherd appears, you will receive the crown of glory that does not fade away” (1 Pet 5:2–4). An overseer then must be blameless, the husband of one wife, temperate, sober-minded, of good behavior, hospitable, able to teach; not given to wine, not violent, not greedy for money, but gentle, not quarrelsome, not covetous; one who rules his own house well, having his children in submission with all reverence (for if a man does not know how to rule his own house, how will he take care of the church of God? ); not a novice, lest being puffed up with pride he fall into the same condemnation as the devil. Moreover he must have a good testimony among those who are outside, lest he fall into reproach and the snare of the devil. Jesus also built His House as His temple for worship (1 Cor 3:16–17; 2 Cor 6:16). The congregations that make up the house of God worship God whenever they can. However, they also worship when they gather together for the assembly. In the New Testament, the whole congregation gathered together in what was called “the Assembly” (1 Cor. 14:23). They gathered at other times, but when they gathered in the Assembly, they worshiped on the Lord’s Day by partaking of the Lord’s Supper along with prayers, teaching, singing, and giving to the collection. The congregation gathered to worship, and also to edify of the minds of the congregation and to encourage one another. The writer of Hebrews urged and instructed saying, “And let us consider one another in order to stir up love and good works, not forsaking the assembly of ourselves together, as is the manner of some, but exhorting one another, and so much the more as you see the Day approaching” (Heb 10:24–25). For the intellectual edification of the congregation, the apostle Paul has revelation that the assembly is “that the church may receive edification” (1 Cor 14:6). The assembly is to “be done decent and orderly” (1 Cor 14:40). Congregations gathered to worship, to encourage one another, and for edification in knowledge. In assembly and all times, Christians are to worship in spirit and truth (John 4:24), and are commanded not to worship in vain by the traditions of men (Matt 15:1–11; Col 2:20–23). In the Bible, congregations gathered into the assembly to partake of the Lord’s Supper, a meal established by Jesus, and these Christians were to pray, sing, learn from teaching, and give to the collection (1 Cor. 11:20–34; 14:15, 26; 16:1–2). Because Jesus built His church, the organization of the assembly is perfect and complete established by Christ Himself. Others have altered and modified these activities of the assembly adding to them and taking them away from the house that Jesus built. Jesus revealed about the Lord’s Supper, “I will no longer drink of the fruit of the vine until that day when I drink it new in the kingdom of God” (Mark 14:25). What right does a person have to change “the fruit of the vine” in the Lord’s Supper into anything else? Did not Christ correctly set the Lord’s Supper the first time? What right does any person have to change the praise of “the fruit of the lips” into lifeless instruments (1 Cor 14:7; Heb 13:15)? Christians must keep the simplicity and purity of what Christ made perfect. The Scriptures also teach that the assembly was on the first day of the week, which is the day that Jesus raised from the dead, met with His disciples, sent His Spirit, and the church was established. The apostle John refers to the day of Jesus gathering with churches as the Lord’s Day (Luke 24; Acts 20:7; Rev 1:10). Acts 20:7 states, “Now on the first day of the week, when the disciples had assembled to break bread, Paul, ready to depart the next day, spoke to them and continued his message until midnight.” This passage establishes the example of the early church and the apostles to meet on this day for the Lord’s Supper. This breaking of bread is the Lord’s Supper (1 Cor 10:16). Paul also instructed that the first day of the week is also the day for which the churches among the nations stored up into the church’s collection (1 Cor 16:1–2). For when two or three are gathered in Jesus’s name, He is in the midst of them (Matt 18:20). For this reason, the congregations gathered as a whole congregation on this day every week (Heb 10:24–25). These are some essential characteristics of the house of God, and much which is lost among Christianity today. This Christian writes this with concern in his heart to encourage everyone to turn to Christ and the church that He built. Many souls do not even know how to enter the house of God. When Christ established the church, God saved and added to the church those who submitted to baptism (Acts 2:41, 47). Few know that there is only one baptism (Eph 4:4). This one baptism was done in Jesus’s name. For this one baptism was started being commanded by Christ. Jesus instructed His apostles, “Go therefore and make disciples of all the nations, baptizing them in the name of the Father and of the Son and of the Holy Spirit” (Matt 28:19). When submit to baptism, they enter into the church (1 Cor 12:13; Col 1:24). Jesus taught that “He who believes and is baptized will be saved; but he who does not believe will be condemned” (Mark 16:16). Before baptism, one must believe and confess faith in Jesus’s resurrection and that He is the Lord (Rom 10:9–10), and they must repent from their wicked deeds (Acts 2:38). After this, the believer must humble oneself to baptism, which is the moment of salvation when God forgives and washes away sins (Acts 22:16). The apostle Peter warned, “For the time has come for judgment to begin at the house of God; and if it begins with us first, what will be the end of those who do not obey the gospel of God?” (1 Pet 4:17). Previous Previous post: Why Would Anyone Need Jesus’s Blood to be Saved? Why are children the first to enter the house of God? I did not first understand this comment. I think this person meant that children enter the kingdom of God, which is the domain of Christ’s reign and authority that extends from earth into heaven and further to the paradise of our risen bodies. I will post more on the kingdom of God soon. WOW! I didn’t know it had gotten this bad. Should I be surprised by your response? I ask this because I am surprised, but don’t remember why I should be. Your example of the biker assembly is not surprising though. I’ve seen assemblies on youtube involving circuses and clowns giving communion. Scott, I think you really hit it on the head. In my home town we have a Pentecostal Church who have this huge biker rally each year. Their membership is near 1000. Two Sundays ago one of my friends ( a biker ) attended for the sole purpose to be with them on their ride after Church. He told me that they had 4 motorcycles inside the Church near the “alter” and the Pastor instructed the members not to touch the motorcycles. The reason he said this was because once the music gets cranked up, they go into a frenzy. They were running back and forth through the Church building, falling on the Church floor, even jumping up and down like they were at a mosh-pit. The “praise team” were all wearing black shirts with Harley logo’s and swaying back and forth. I caught part of this on their local “Christian Network” and it just amazes me that people can act that way and call it worship when nothing even close to this is in the bible. What is your point? Is it that Jesus’ words were in accordance to cleansing and atonement in the Law? The Torah is only a Jewish commentary to me. I’ve been made perfect and atoned in faith like Abraham and not by the Law of Moses.